Home Everything else 15 Best Tech Grilling Gadgets. Collection of ‘Best Tech Grilling Gadgets’ from all over the world to make your grilling more fun and enjoyable. Spinarri AutoSkewers: These motorized skewers are designed so that you don’t need to attend for rotation, these automatically and constantly rotate the multiple skewers over your existing grill. Available as model 543 and 975; the S-543, aptly named 543 for its ability to equally space 5, 4 or 3 Autoskewers while S-975 can equally space 9, 7 or 5 Autoskewers. These are crafted from premium grade 304 stainless steel and their handcrafted wooden handles are sourced from Northern Maine. These can be used with charcoal and gasgrills. The 360 Grill-Fryer: It combines a deep fryer, grill, griddle, and heating plate into a single circular gas-powered unit. Mesa: Mesa is an all-in-one cooking platform that brings the chef back to the table, and lets the whole family participate in crafting a well-balanced meal. This indoor grill station features a primary griddle that can be used for general-purpose heating, along with a second customizable cooking surface that accommodates a variety of dishes. Qbox: Qbox is a smart Wi-Fi connected barbecuesmoker that lets you monitor and control it from anywhere using your smartphone. Using its app you can remotely monitor your food’s progress; it alerts you and keeps your food warm until you get home. Range: Range allows you to cook better with precise temperature readings and makes the perfect meal. Grillbot: Just place this grill-cleaning robot on your grill and press a button and you’re done. Its three powerful motors and three brushes provide reliable and thorough cleaning. You can set it on light clean or deep clean, and it signals when cleaning is complete.Refuel Smart Propane Monitor: The Refuel, Quirky’s smart propane tank gauge connects to your smartphone using the Wink app and keeps you updated with propane levels and lets you know when its time to refuel. All you need to do is place your grill in range of a Wi-Fi network, and it allows you to monitor your propane supply. If there is no Wi-Fi or smartphone, just tap the Refuel and it displays light reading of the propane level and the green light means go. 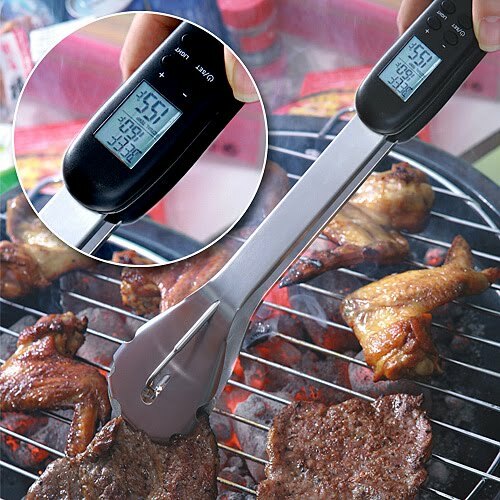 Digital BBQ Tongs: These tongs comes with a built-in display, and the tip measures the internal temperature of the meat and beeps when it is cooked. GrilLit Automatic Grill Light: The GrilLit attaches to the holder of most grills and provides instant illumination to the cooking area. It lights up when the grill cover is open and turns off when the cover is closed. iDevices iGrill Mini: The iGrill Mini is a Bluetooth smart grilling temperature meter that lets you know when your food is ready from your smartphone. 15 Functional Travel Gadgets – Part 10.